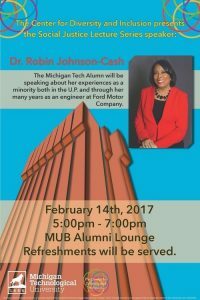 HOUGHTON — Robin Johnson-Cash spoke at Michigan Technological University’s Alumni Room of the Memorial Union Building on campus Tuesday evening, February 14, 2017. She was the featured speaker of Michigan Tech’s Center for Diversity and Inclusion’s Improved Social Justice Lecture Series. Johnson-Cash, the first African-American woman to earn a PhD from the Department of Mechanical Engineering, Engineering Mechanics (MMEM), offered some insightful advice to the students who were present for her talk. Read more at the Daily Mining Gazette, by Graham Jaehnig.